I’m sure you know which girlfriend I’m referring to? Yes, the girlfriend you go to when you need that one missing piece to complete your outfit. Just because her closet is like a showroom (or maybe a boutique store?) filled with anything you can think of. So when it comes to finding a Christmas gift for her, what do you do? Well, luckily, you got me. I grew up with girlfriends who aren’t just stylish themselves, but also have sisters who are skilled at picking out the right on-trend pieces. And I believe this has trained me well when it comes to finding them Christmas (and birthday) presents! Read on for some of my tricks! I personally love to customize products even for myself and I think it always adds a nice touch to whatever it is that you are gifting, too! [#Sponsored] One of my favorite go-to jewelry brands that offers customization is Monica Vinader. Many of Monica’s designs allow you to engrave names, dates or other special messages. I’ve been a big fan of this British luxury jewelry brand since it launched about 10 years ago! I was living in the U.K. back then before the brand came (and I, moved back) to the U.S. If you’ve been following me on Instagram, you’d notice I wear their Signature Thin Bangle very often. Even HRH Duchess of Cambridge wears Monica’s pieces, too, by the way! Monica Vinader celebrates individuality, which is why you can find a variety of customizable options, whether it is to engrave, inter-change the charms or stacking multiple pieces on one another. 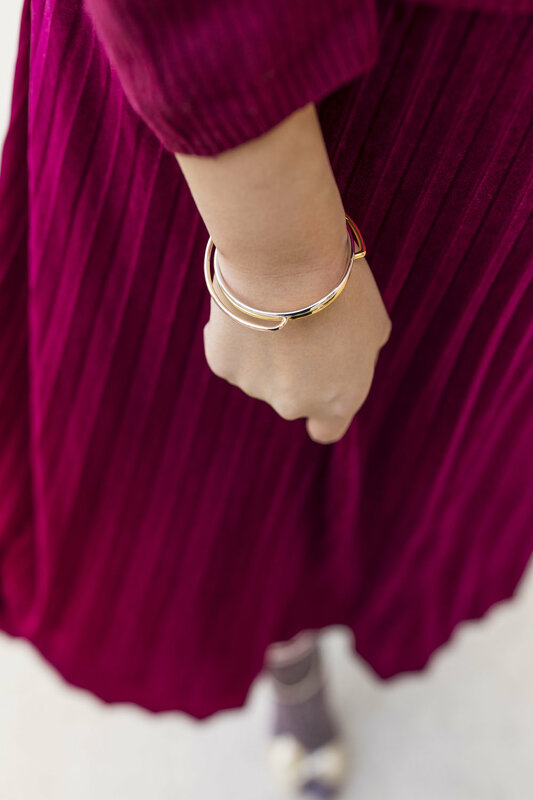 If you prefer not to engrave, you can consider the Alta Collection; check out how I styled the bracelet in 5 different ways here! (Above) The Linear Chain Bracelet engraved with “Since 1986” adds special meaning to the gift, and makes it unique! (Left) Monica Vinader is one of my favorite brands to shop from when it comes to gifting during the holiday season. Photo taken by Ashley Gallerani. (Below) Stack and style the bracelets to create your own arm candy! Photo taken by Ashley Gallerani. For more customizable gift ideas, you can check out my blog post here. Can anyone really have “too many” earrings or “too many” scarves, for instance? I don’t think so! When it comes to jewelry, I like to pick out classic pieces but with a twist, like these Square Hoop Earrings from Uncommon James or these mismatched Separate Ways Earrings by Jenny Bird. They’re simple, yet different, and I think your fashionable friend will really appreciate it! Other great options are winter accessories if they live in cities where they need to stay stylish and warm at the same time. I think these colorful fur mittens or this beanie with crystals, for example, are statement-making and good fun! Another great approach is to go for staple pieces, i.e. pieces that are considered “basics” and make up the foundation of every closet. Examples include a quality cashmere sweater. Cashmere isn’t something that will ever really go out of trend, and really good ones will last for a long time. I’ve recently became a big fan of W. Cashmere, a brand that carries an amazing collection of soft cashmere pieces in beautiful colors. I’ve been wearing a grey one from W. Cashmere at least once every few days lately, because it just works so well with a lot of my other pieces in my closet. Another brand that I will be going to for gifting this year is Commando! I used to only associate Commando with underwear, so if you are the same, it naturally would seem out of the ordinary to gift someone anything from the brand. But Commando now has a great collection of bodysuits and leggings that provides good control with their cool firming fabric! The leggings come in so many options, too, including velvet, faux leather and patent leather! Because they are basic pieces, anyone would be able to put them to good use. Wearing a grey W. Cashmere sweater. Photo by Ashley Gallerani. This outfit features Commando’s Perfect Control Faux Patent Leather Leggings. Although your trendy friend may have everything, it is less likely she would have already owned something from a younger brand. Imagine how great it’d feel to be the one introducing a new designer to her! One of my favorite new brands include New York City-based shoe label Daniella Shevel. Daniella Shevel has a beautiful collection of unique footwear that are designed to flatter your legs and feet, while making sure they are extremely comfortable to wear and walk in. When I first tried on Retro Lady, I was genuinely surprised by how well it molded to the shape of my feet. I didn’t even need to break them in! The brand has recently just launched several new styles that are great for gifting this season, so check them out! If your budget isn’t that high, consider checking out a new jewelry brand called Glod. Their designs are inspired by the way light works and I love that they have pieces that combine three tones in one: gold, rose gold, and silver! Having all three tones allow me to easily pair it with all the other pieces I already own. Jeff Wan’s Lunch Box in metallic red. GLOD’s bracelet features three tones in one. Use TRICIA15 for 15% off your order. What are some of your tips and tricks when it comes to shopping for the one girlfriend who seems to have everything already? Share them with me by leaving a comment below! As always, thank you for stopping by Happily Ever Style!